Today I'm presenting the last, but not the least, in a series of February guest designs and it's for something brand new, so it's a pleasure to help spread the word! Okay, I made up that last one, but you get the idea. 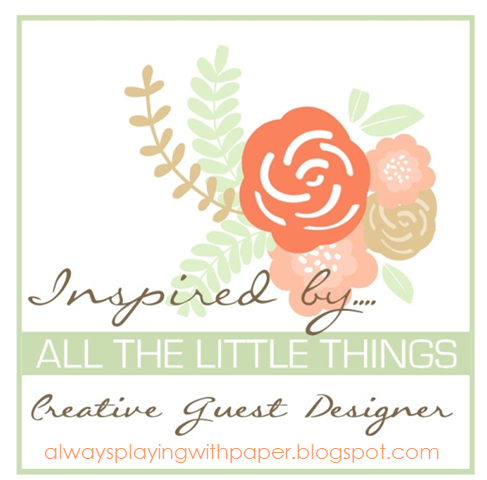 The creator of Inspired by All the Little Things is none other than Lesley Croghan of Always Playing With Paper. Lesley moved into Blogland back in 2009 and promptly became the Mayor of Challenges. I could list them all, but it's more impressive if you check out the resume she has on her blog here. You'll need a lie-down after you read it! This is NOT a challenge but I hope you will "play" along and share how you were inspired by my inspiration photo. Of course, you may not be inspired at all! But if you are...please share! So there you have it! 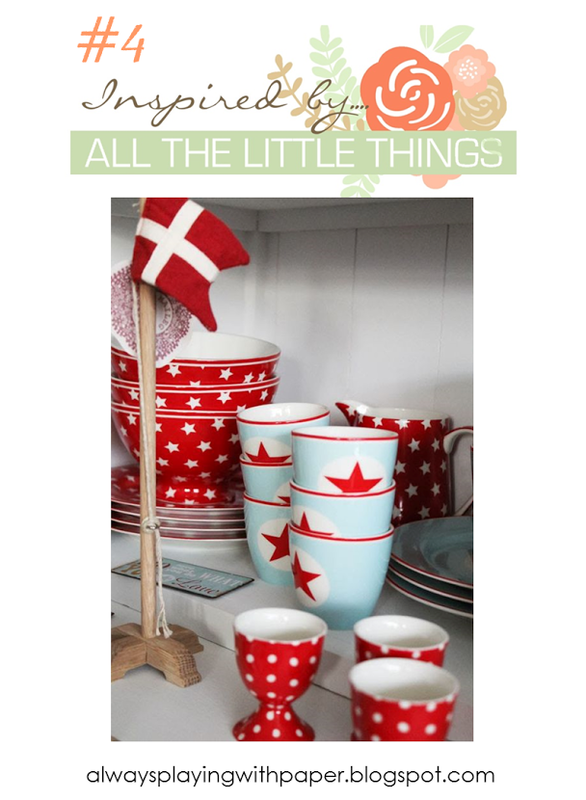 Inspired by All the Little Things is a place where we can share with each other and inspire each other! No competition ~ just inspiration ~ and, of course, enabling! There's always that! Lesley has a linky tool for you to share how her weekly photo inspired you. I used those Lil' Inker stitched rectangles again. This time my NBUS stitched ovals made their debut. As a matter of fact, everything else on the card is NBUS, too. The Poppystamps teacups were inlaid. (I sometimes call it paper-piecing, but really it's inlaying or laying in. Then there's laying about, but that's for the end of the day or your no-good Uncle Scradmer.) The banner and sediment are from the Layered Banner set by Papertrey Ink. Instead of stacked cups, we stacked paper shapes. You might think every shape of stitched die known to man has been used for this card, but not so. Nowadays you can get stitched anything on a die. The stitched star is NBUS, as is the hello sediment from Simon Says Stamp. Thank you, Lesley, for the honor of being the Guest Designer for this new and fabulous card game! I hope to see a lot of you joining in. Play for fun and share how you were inspired by all the little things!! The next semi-annual NBUS (Never-Before-Used Schtuff) Challenge is just around the corner! Mark your calendars for two weeks from today!! Wheet!! If you are new to NBUS and would like more information, please click here. Gorgeous, and I need that fab teacup die! Fab cards. I love the colours. Wow have you had the die cutting machine hammering them out. What a wonderful collection. Love the colour mix too. Great cards and waiting for the NBUS challenge to begin. This new challenge sounds like a lot of fun and I absolutely adore your teacup card. I love the colors and how you inlaid everything. I'm thinking I might also have this die in my NBUS stash. And I always love when you give us a twofer. Excellent cards. Stunning card! love the bright colors you have used.I have seen this feature, and would surely love to play just for fun, thanks for reminding Darnell. Both cards are fabulous...and how perfect to make the second card with what you had left out....love them!!! sounds like a fun place to visit and to be inspired! These are just gorgeous and you have made such a great card with the colours a fab take on the photo well done you! Super awesome card, Darnell!! Love the papers you used - so perfect for that inspiration photo. Love how you stacked your images like the photo and used cups like the photo for your first card. Congrats on the GD position. Wonder Woman Lesley couldn't pick a better woman for a GD!! Thanks for letting me know that Lesley has another challenge going - she really amazes me with her creativity and energy!! I'll have to check out her challenge sometime soon. These are gorgeous! LOVING the colors!!!!!!!!!!!!!!!!!!!!!!!!!!!! Really inspiring photo and your cards are both so pretty!! Love very much that one with the pile of cups, your inlaying is fabulous and the dp is just perfect to CASEing the patterns in the photo!!! What great cards, Darnell! I think that challenge sounds like a good one and boy oh boy did you step up to the starry plate and shoot for the moon! I adore what you have created in your two fer! Thanks so much for sharing! Love your stacked cups in that lovely colour comb and your stacked starry papers look great too. Looking forward to the next NBUS event. I'm already doing practice rounds using my NBUS, but I'm sure there will be plenty of NBUS left to play with in March. Surgery had been postponed because of DH's blood levels and lungs, but it has been rescheduled for tomorrow afternoon after the pneumologist gave him the green light on Wednesday. So we have an exciting day ahead tomorrow. It may be a minor procedure to the surgeon, but it will have a huge impact on DH and me. WOW.... two bee-u-ti-ful cards! LOVE this red/aqua color combination! So you're going across the pond this summer??? Lucky YOU! Looking forward to the NBUS coming up (I haven't used my little heart die yet...*grin*) Speaking of dies.........aren't the stitched shapes the greatest? Thank you for the kind comments you left on my sympathy cards. Just lovely Darnell, love the teacups, can't beat a cuppa! Reminds me I have a matching stamp and die set that haven't seen the light of day yet! Good morning, Darnell! Thank you so much for being my Guest this week! I adore you and your projects. Enjoy your weekend! Both of these cards are so awesome. The red just pops. So pretty. My favorite is the star card. Wow, your stacked cups are as adorable as can be! You nailed the inspiration photo with this wonderful card! Can you tell how much I love this! You are one busy guest,congrats! Two divine cards the colours work so beautifully together and remind me of times gone by for some reason. I especially love the piled up crockery has a real retro feel to it. Hope all is well with you and yours Darnel. Cute cheerful cards. I love polka dots. And they go together really well with stars. Oh Darnell, I adore this cups, the colors you chose are amazing together, and those dishes.....I love, LOVE the egg holders, I'm a sucker for soft boiled eggs and, when you eat them in something gorgeous, they taste even better. The second card is fabulous too, it could be a really festive 4th. of July greeting. PS. How is your hubby doing? I hope he is all better now. These are so very pretty!! I am having a lovely weekend! Hope youa re as well. Beautifull use of the colours! Love how the red let the other colours pop! And a cup of tea is a nescesarry thing every day again :)! Beautiful cards and excellent take on the photo too! Oh la La. 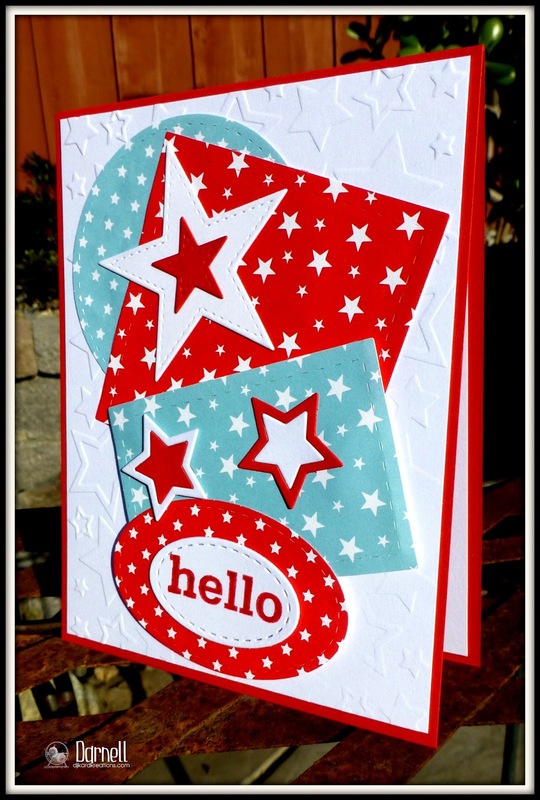 Love, love, love this color combo and your two fabulous cards. They are fabulous Darnell. Great card! I love your gaze cup :-) and courageous conversion into pierced cards. An excellent idea. It is a mark of great creativity, Darnell. As always you've created two great cards! Your NBUS stash must be huge!😉 Love all the "in-laying ". You've definitely showcased the inspiration photo! Wow! Absolutely perfect takes on the inspiration photo. Love the stacked cups especially. Congrats and WOWZA. I would say the Wheaties are working for you. I love the cups, really love the cups. Congratulations on the GD !!! You are always such an inspiration with your your fabulous cards and funny writing!!! No wonder Lesley masked you to be her GD! Love how you interpreted this challenge, especially your inlaid stack of cups! Two beautiful and very happy feelings on these Two-fers. And congrats on your GD task too. You've done splendidly. Love the inspiration and how you've showcased the colors, designs. And extremely impressed at all the stitchy dies, (great to use NBUS,yes? ), and the fiddly inlay pieces. Some look so scant, that I bet it was a tongue-between-your teeth effort, but they look grand. I should have these cheerful cups. As always, you astound with your designs. Great teamwork too, with you & Harmony. She is proving to be as adept as her Dad. Good genes, I guess! TFS & Have a wonderful week, and big hugs. Yup, I agree, you had to make two, couldn't imagine one of them not being made:) they're beautiful! I didn't realize that Lesley was up to another inspiration for us! Thanks for the heads up and a beautiful heads up it is! Golly, do you and the Hamster team ever get around. Congratulations on this Guest Designer gig on the launch of "All the Little Things". Your cards are, well...inspired. You must be so organized to find just the perfect die and patterned paper to fulfill your assignment. I'm so envious, I'm green. Lesley chose well when she picked you, clever girl. This game is on my list to play. These cards are fantastic. I love love love the colors. Thanks for sharing and inspiring us all. And thank you for introducing me to Lesley; I started following her blog instantly!! Two fabulous starry cards. Congrats on your GDT spot. Wow, wow, wow! 2 incredible cards, Darnell! Love the colors, images, layouts--so appealing to the eye I keep staring at them! The teal and red probably is my favorite color scheme of all time ever so these both just make me grin! Awwwwwdorable creations! Two amazing cards, Darnell. Love the bright happy colors you used. And, yay, I am excited to hear that the NBUS is about to begin. I have been preparing and readying myself for this challenge....by making sure I have a large stash of NBUS! Fabulous takes on the inspiration photo! The teacups are sweet and Harmony's more abstract approach is fun! These cards make my star-loving heart beat faster! I have never heard of this challenge, that isn't a challenge! Off to check it out! The spotlight could not shine on a more deserving blogger!! What a cute inspiration photo, love the colors. Your cards are both just as cute as cute can be. LOVE the stacked cups. England in July huh, sounds like a good time!! Great to read your interview and to read all about you. lovely cards, as usual. Thanks for your positive comments on my AYSI card. Hey, you. Awesome cards-- I can definitely see how you were inspired by the pic., and what a nice description you gave the new inspiration blog! Let's lift eachother! And thanks for reminding the people that life is too short... Your attitude is awesome. What fabulous cards Darnell - your wee Hammy and Hammiettes really are very clever little people - learning from you no doubt!! Well done, thou good and faithful carder! Great cards and the new "play along" sounds fun. Love those bright and colourful cards Darnell and very much enjoyed reading your post today! So pleased to see you featured as one of Leslie's designers. Bravo! Two fantastic cards Darnell! as always you inspire! I love this combination of colors! Fabulous cards Darnell! Crisp, fun and fresh - great takes on the inspiration photo. Congrats on being featured as guest designer. Well if it were a challenge, you rocked it! Fabulous cards and they totally represent that photo ... Congrats on your GD spot too! Crisp clean and lovely inspired cards. Thanks for the visit and kind words. I find the dots and the contrast between red and white to be very inspiring. I like the cards you made with your inspiration! Well Darnell, I really think you outdid yourself with this one! Now isn't this proof positive that it is absolutely necessary to keep an enormous stash of goodies so that you can whip out the PERFECT materials for any given card challenge? I love the colours, the design and the beautiful inlay. Fantastic job my friend. Congrats on yet another GD spot pal! You are rocking these gigs! Adore these sweet, whimsical little tea cups - especially with the cool DP and the light blue, red & white color combo! Quite festive! The star card is really neat-o too! Would make a great 4th of July 'hello'. Nice touch with the star embossed background too. Congratulations, Darnell! I'm so happy to see you and your fabulous work being featured on Lesley's blog. Love the idea of this, too! Your cards are fabulous. Wow! Amazing interpretation of the inspiration photo. Yikes! These are beyond gorgeous! I just love all the stitched dies and the colors are super dreamy/ to die for! Well done Darnell!! Both cards are amazing as always. Looking forward to NBUS challenge in March. wow, gorgeous ness going on here Darnell. Love both cards couldn't choose if I had to. You'll be a fabulous ambassador! Love, love your colorfully stacked tea cups!! So fun! I'm back!! : ) wrote a novel this morning on my blog a photojournalistic approach to some of what has kept me from blogland so long. I can't say thank you enough for all the love and encouragement you have sent my way during my long absence. You are surely part of the reason I'm back!! Oooooh, I love the pop-your-eyes-open brightness of these cards!! Of course, teal and red is one of my favorite color combos. You rocked it with these gorgeous cards, Darnell! Congrats on your GD feature, Darnell! Your cards are absolutely gorgeous! Love these colours! I especially love those teacups! I received those teacups as a gift so they are NBUS for me! Maybe I'll hold off until your challenge hehe! I love those cups, Darnell. I hope the ones I just ordered from Uniko are as nice. Speaking of order, you seem to have a LOT of NBUS. No wonder you call it a mountain. I love seeing all your new things. Looks like I have some catching up to do ..... I missed these! Fabulous cards as always. Those tea cups are just adorable. I LOVE the cards that you created for this fun challenge. 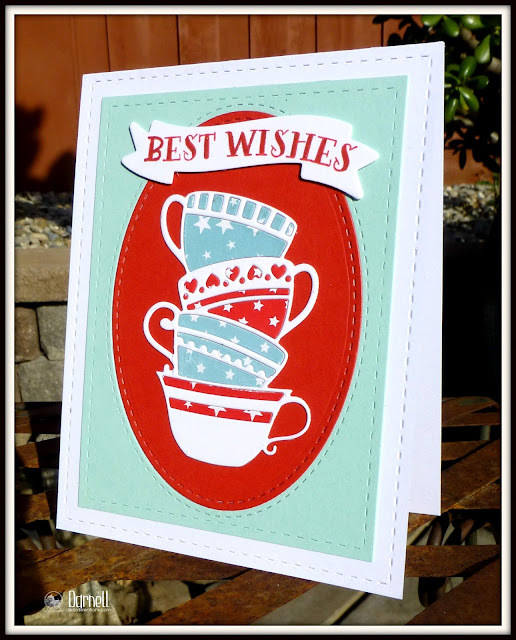 The tea cups are just adorable with the fun inlaid patterned papers. You are amazing!! What a great news! Looking for the new challenge! I will take note!!! I have some new products to play with!!! Great! These cards with these combo colours are just the cuttest! Wonderful cards! I really love the stacked tea cups, it's such a cute die and I like that you used patterned paper.